The First Annual car show in Durant is July 23rd 2017 (July 30 rain date), in the Durant Parking Lot (408 7th street, Durant, IA 52747) and would like you to be a part of it! Invited to the show are cars of every kind: Classics, Muscle Cars, Trucks and Special Interest cars of all types and sizes. Our car show is open and free to spectators who enjoy cars and a good time from 10-1. 1st – 3rd Trophies for the following classes: Classic Car, Muscle, Modern Muscle, Toughest Pick-up Truck, and Open Class. Also Grand Prize Trophies for Best in Show and Children’s Choice. Dash Plaques for first 50 registrants. $5 Pre-Registration available until July 1st OR $10 at the gate. 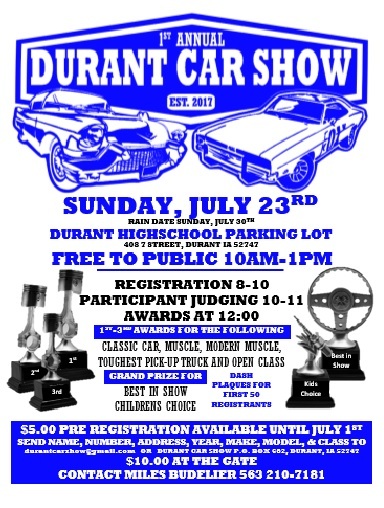 Send Name, Number, Address, Year, Make, Model and Class to durantcarshow@gmail.com OR mail to Durant Car Show, P.O. Box 682 Durant, IA 52747.